• Commentary - this audio commentary with film historian Drew Casper also includes excerpts from an archival interview with actor James Whitmore (Gus Minissi). It initially appeared on the R1 DVD release of Asphalt Jungle from Warner Bros. Home Entertainment. • John Huston - presented here is a short archival interview in which director John Huston quickly comments on The Asphalt Jungle. In English, not subtitled. (1 min). • Pharos of Chaos - this outstanding archival documentary film offers a fascinating glimpse into the personal world of actor Sterling Hayden. It was directed by Wolf-Eckart Buhler and Manfred Blank in 1983. In English, not subtitled (119 min). 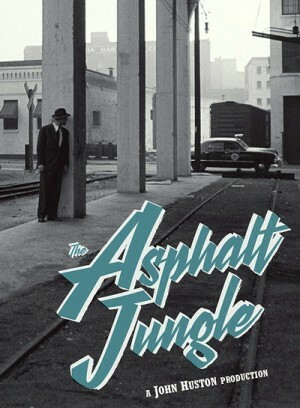 • Eddie Muller - in this brand new interview, film noir historian Eddie Muller (Dark City: The Lost World of Film Noir) deconstructs The Asphalt Jungle and explains what makes it a quintessential American crime film. The interview was conducted exclusively for Criterion in 2016. In English, not subtitled. (25 min). • John Bailey - in this brand new video interview, cinematographer John Bailey (American Gigolo, Cat People) discusses the visual style of The Asphalt Jungle and various specific technical choices made by cinematographer Harold Rosson (with excellent observations about the use of lamps/dramatic lighting, wide angle lenses, low angles, the psychological rawness that is incorporated into the visuals, etc). The interview was conducted exclusively for Criterion in 2016. In English, not subtitled. (21 min). • City Lights - presented here is an archival episode of the television program City Lights in which director John Huston discusses his personal life and professional career. The episode was broadcast on October 10, 1979. In English, not subtitled. (49 min). • The Huston Method - presented here is a new piece edited from several archival audio interviews in which John Huston discusses his approach to writing and directing. The interviews were conducted by critic Gideon Bachmann. In English, not subtitled. (7 min). • Trailer - original trailer for The Asphalt Jungle. In English, not subtitled. (3 min). Thank you for all your work here. Happy holidays.